From memory, this is possibly the first dish that I have ever learn to cook from my nan. The first amongst her many other wonderful achieves of recipe. She was like a walking recipe encyclopaedia. As a child, she was always curious about everything that she'd ever put into her mouth. Always making a point to queried about the ingredients and the process of how every dishes were prepared. She would begged the chef to reveal their recipes, tested them herself, and then re-invented them to suit her astoundingly acute palate. In my eyes, my nan was simply the best cook in the world! 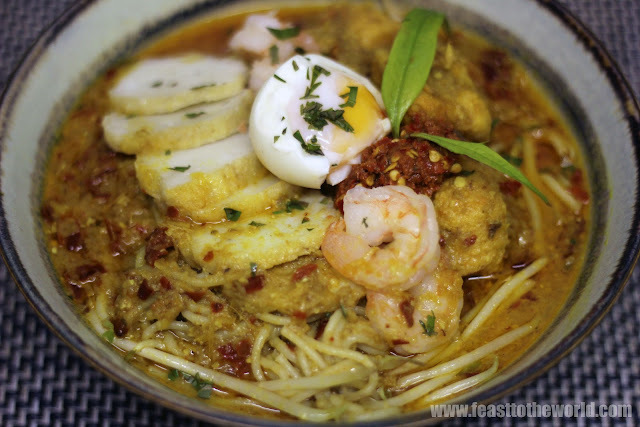 In Malaysia, this is known as Laksa Lemak but across the causeway bridge, this is possible more famously being refer to as the notorious 'Katong Laksa'. 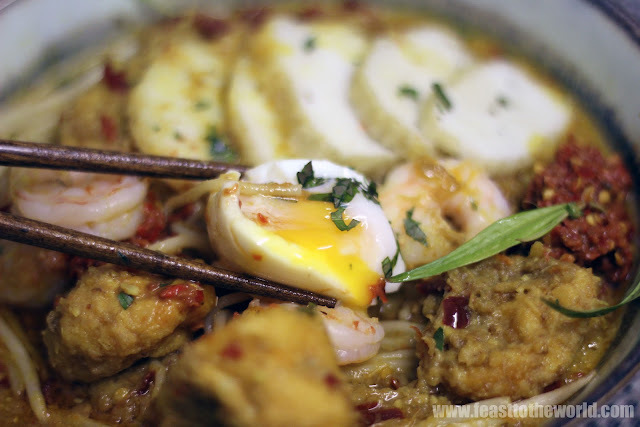 As most Singaporean would know , for the best laksa, it's best to trek all the way to Katong and patron the hawkers there for the best of its kind, ignoring any inferior imitations along the way. 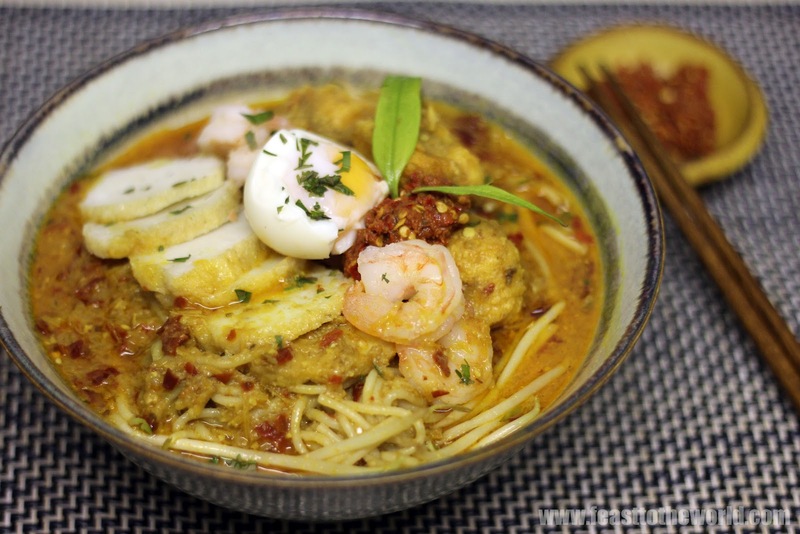 This is altogether very different to Penang Laksa. The former uses coconut milk and dried shrimps that gives it the rich and creamy soup base while the latter is sharp and tangy, due to the appearance of tamarind and has an intense fishy stock made with mackerels. For any of you who is familiar to the PROPER Katong Laksa, your eagle eyes will immediately detect the lack of a certain crucial ingredient that is known as the blood cockles in Singapore or see hum as the local would called it. Well, I will salute you as your spider sense in indeed tingling. Just like in my previous effort of the Char Kway Teow........this exotic shell life is too bloody hard to get hold of (uh..hummm forgive the pun) outside Southeast Asia. Although the news on the street is that there might be a way round it so if you do know where I can get my desperate hands on some see hum, do get in touch. I did however, managed to secure the all-important daun kesom or laksa leaves/Vietnemese mint. I have stumble upon a pot of this during my recent visit to my favourite Maltby Street Market. Imagine my surprise and without any hesitation, I bought this love plant and into my garden it went. After the recent spell of miserable rainy days, at least one positive thing came out of it....my daun kesom is blossoming into a fine looking plant before my very eyes. 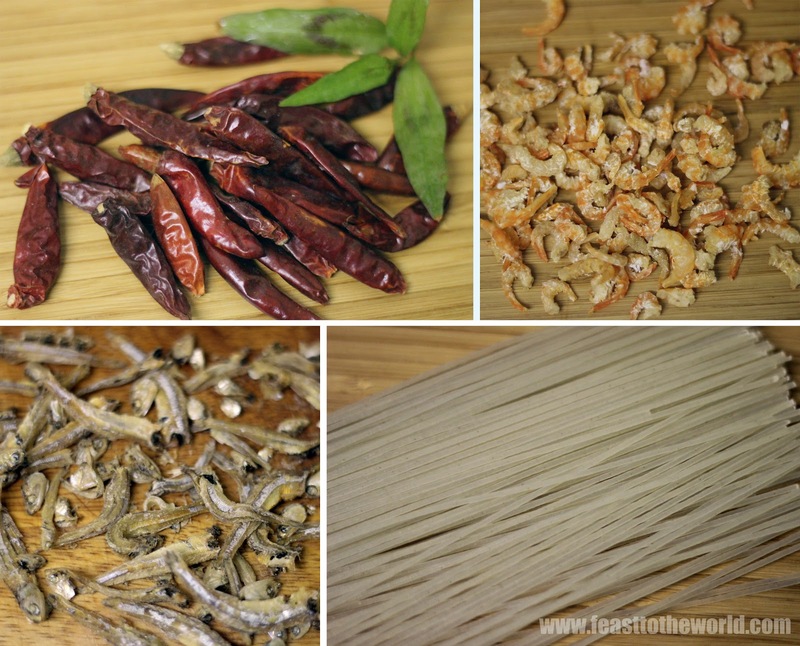 The leaves gave the dish a very distinctive peppery and zingy freshness that will complement this noodle dish beautifully, however, if you can't get hold of it, just leave it out and you'll still have yourself a very tasty bowl of warming noodles broth. 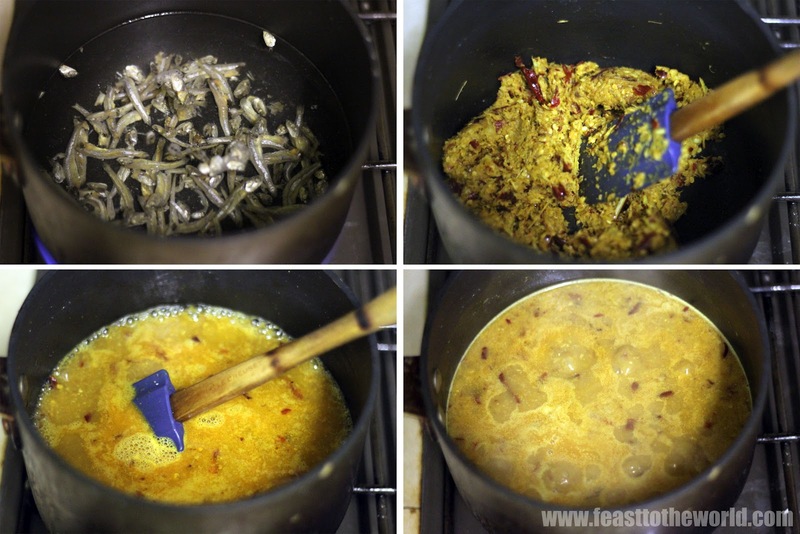 In a pan, cook the ikan bilis/anchovies in the water for 30 minutes to make a stock. Strain and discard the fish. To serve, tip a small handful of noodles in a large bowl. 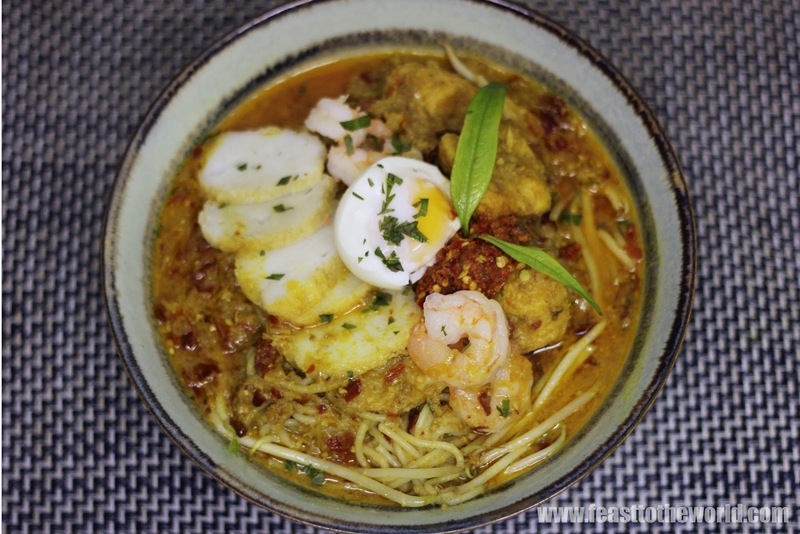 Top with the prawns, fishcakes,beansprouts, egg and spoon in a cuople of ladlespoonful of soup. Scattered with the chop daun kesom and serve with some Sambal belacan. OH MAN! Why didn't you post this earlier? Should have tried your recipe instead!